(CNN) -- Scientists at NASA have discovered a nearly invisible ring around Saturn -- one so large that it would take 1 billion Earths to fill it. 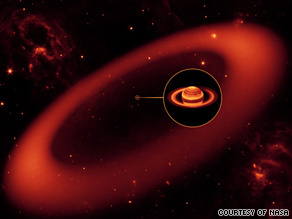 NASA's Spitzer Space Telescope has spotted a massive, nearly invisible ring around Saturn. The ring's orbit is tilted 27 degrees from the planet's main ring plane. The bulk of it starts about 3.7 million miles (6 million km) away from the planet and extends outward another 7.4 million miles (12 million km). Its diameter is equivalent to 300 Saturns lined up side to side. And its entire volume can hold one billion Earths, NASA Jet Propulsion Laboratory said late Tuesday. "This is one supersized ring," said Anne Verbiscer, an astronomer at the University of Virginia in Charlottesville. Verbiscer and two others are authors of a paper about the discovery published Wednesday in the journal Nature. The obvious question: Why did it take scientists so long to discover something so massive? The ring is made up of ice and dust particles that are so far apart that "if you were to stand in the ring, you wouldn't even know it," Verbiscer said in a statement. Also, Saturn doesn't receive a lot of sunlight, and the rings don't reflect much visible light. But the cool dust -- about 80 Kelvin (minus 316 degrees Fahrenheit) -- glows with thermal radiation. NASA's Spitzer Space Telescope, used to spot the ring, picked up on the heat. One of Saturn's moons, Phoebe, orbits within the ring. As Phoebe collides with comets, it kicks up planetary dust. Scientists believe the ice and dust particles that make up the ring stems from those collisions. The ring may also help explain an age-old mystery surrounding another of Saturn's moons: Iapetus. Astronomer Giovanni Cassini, who first spotted Iapetus in 1671, deduced the moon has a white and dark side -- akin to a yin-yang symbol. But scientists did not know why. The new ring orbits in the opposite direction to Iapetus. And, say researchers, it's possible that the moon's dark coloring is a result of the ring's dust particles splattering against Iapetus like bugs on a windshield. "Astronomers have long suspected that there is a connection between Saturn's outer moon Phoebe and the dark material on Iapetus," said Douglas Hamilton of the University of Maryland in College Park -- one of the three authors reporting on the findings in the journal Nature. "This new ring provided convincing evidence of that relationship."